As an RV owner, you yearn for the open road. You schedule trips across state and country to experience life through locations. Your home base may be in California, but you plan on seeing all 50 states (or at least the better half of them). Your trips can take a few days to a few weeks, and you’re always searching for somewhere new to explore. But what happens when you pull into your driveway at home and don’t have a cover for your RV? Inclement weather not only affects you while on the road, but it can also affect your RV while it’s parked at home. For most, they cover their RV with a tarp or blanket to keep the sun and water off of it. However, these “covers” don’t protect your RV from hail, wind, and other elements that may damage it over time. Even one hail storm can severely damage your RV. You want to protect your RV, and you can do just that with an RV Carport. At Wholesale Direct Carports, we offer metal RV covers to fit your needs. In this article, we want to share what you need to consider before buying a carport for your RV. 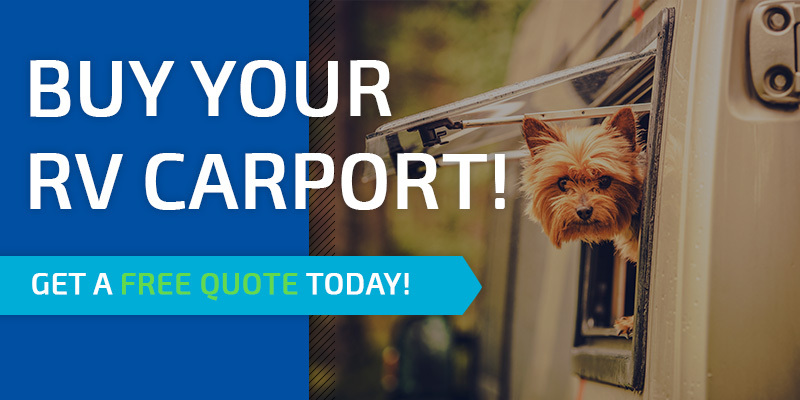 We also want to share why you need a carport to store your RV. Ready to start the conversation on getting a carport in California? Call our team today. Otherwise, read this blog to learn more. #1. What Will You Be Storing? While your RV will be the primary belonging you store in your RV carport, consider what else you want to store. Your RV is not the only thing you take with you on you adventures cross-country. You may need to store a tow-behind vehicle, RV maintenance supplies, or spare parts. Knowing what all you will be storing in the carport will make it much easier to decide on the size. 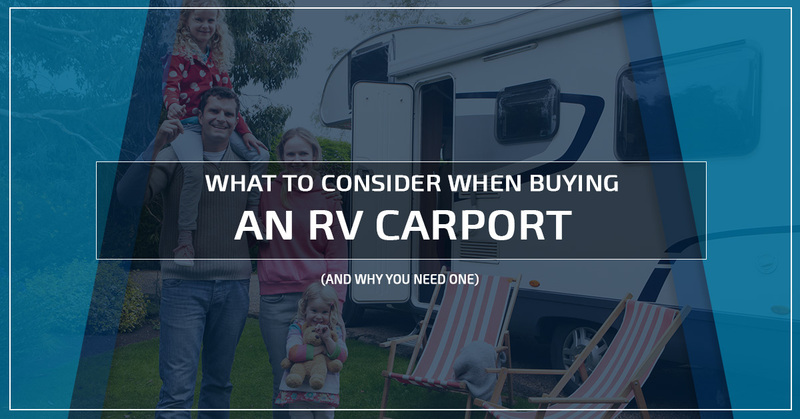 How much room do you actually have to build an RV carport? You want to decide where your RV ought to be stored and then determine if a carport will fit. For most, they store their RV down the side of their home or alongside their driveway in a designated area. If you’re tight on space, it may be best to call Wholesale Direct Carports to help you determine how to fit a carport on your property. #3. Do You Want Walls? While Wholesale Direct Carports does not view a carport as having walls, you can customize them to fit your needs. You can have walls as a partial enclosure or a complete enclosure that protects your RV as much as you desire. #4. What is the Weather Like in Your Area? California can get some pretty serious weather. The range in temperature can be a concern, as well, to RV owners. What’s important is knowing what to expect when it comes to the weather. Rain, wind, and temperature are all of serious concern when it comes to protecting your RV. An RV carport can withstand winds up to 175 miles per hour (mph) and up to 65 pounds per square foot in snow ratings. #5. Do You Want a Specific Color? As a homeowner and RV enthusiast, we know how much you care about color matching your carport to your home. You want your carport to look like it belongs near your home, not an eyesore your neighbors are going to ask about in a few weeks. At Wholesale Direct Carports, we offer a variety of standard carport colors, as well as custom color-matching services. You need an RV carport to protect your investment in your RV. Not only does your RV provide you with unfettered access to the open road, but it also provides you with a sense of pride. An RV carport offers you a way to save money and time when it comes to maintaining and repairing your RV. An uncovered RV is at danger to be damaged by rain, hail, wind, debris, and more. When you store your RV in a covered enclosure, you want peace of mind that it’s protected. After more than 18 years of experience, Wholesale Direct Carports understands what you’re going through. When it comes to buying an RV carport, you want to make sure you’re getting top-tier materials and products. We work with the top manufacturers to ensure quality and durability. Call our team of experts today to get your carport ordered.